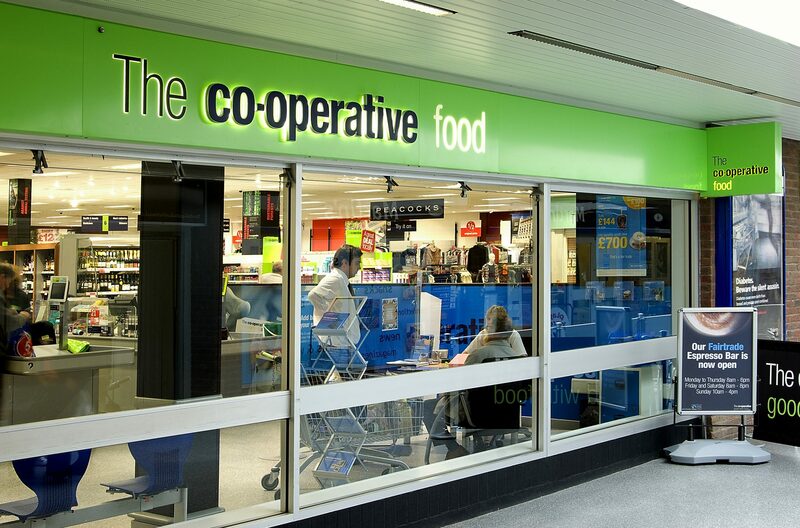 The Co-operative Food is the grocery retail business of The Co-operative Group, more commonly known as The Co-op. The Co-op is one of the world’s largest consumer-owned businesses, with over three million members and 87,000 employees across all its operations, which include food retail (the largest division of the Group) , travel, funeral care, pharmacies, finance, farming and legal services. The Group’s corporate members include regional and local retail societies. The Co-operative Food business accounts for around 7% of the UK grocery market, making it the fifth-largest food retailer in Britain with a chain of over 2,200 food stores. The formation of The Co-operative Group happened over 140 years (starting in the 1860’s) from the merger of many independent retail societies, and their wholesale societies and federations. The North of England Co-operative Society was launched in 1863 by 300 individual co-ops across Yorkshire and Lancashire . By 1872, it had become known as the Co-operative Wholesale Society (CWS). The 20th century saw a series of smaller societies merge with CWS, including the Scottish Co-operative Wholesale Society (SCWS) in 1973 and the London-based South Suburban Co-operative Society in 1984. CWS changed its name to Co-operative Group (CWS) Limited in 2001 following its merger with Co-operative Retail Services (CRS) in 2000. Another merger took place with Yorkshire and North West-based United Co-operatives in July 2007, which reinforced the Group’s position as the largest consumer co-operative in the world. In 2008, The Co-operative Group announced a £1.57 billion takeover deal of the Somerfield supermarket chain. The deal was approved by the Office of Fair Trading in October 2008 after the UK watchdog said no competition issues were found at a national level, but stipulated that The Co-op will have to offload at least 126 Somerfield stores to address competition concerns in local grocery markets. Once completed, the move will cement The Co-op’s position as Britain’s fifth-largest supermarket chain, with a store portfolio of more than 3,100 supermarkets and convenience stores, and projected annual sales of £10 billion. In February 2009, The Co-op confirmed that 650 Somerfield stores will be converted to its own-brand, around 130 Co-op stores with competition concerns will be closed, and all Somerfield operations moved from its head office in Bristol to the Co-operative Group’s existing headquaters in Manchester . The Co-operative has been the UK ’s biggest supermarket supporter of Fairtrade since 1992. The Groups sells Fairtrade products in more outlets than any other retailer and also provides the widest range of Fairtrade products, with around 150 own-brand products and over 50 branded Fairtrade products. In 2008, the Co-op launched its Food Ethical Policy following the feedback gained from its consumer poll on food ethics. Just over a quarter (27%) of the 100,000 Co-op members polled identified Ethical Trading as the number one priority for the group. The Co-op’s store portfolio consists mainly of convenience stores and small-medium-sized supermarkets, although some larger superstores remain in the estate. The majority of these stores are based in neighbourhood areas. The Group decided to avoid following the ‘big four’ supermarkets’ large store format as its members believed a smaller community approach would be more compatible with the values and principles of the co-operation. The Co-operative Food stores offer customers a range of own-label food and drink products. Food ranges include the ‘Standard’ value range, the ‘Truly Irresistible’ premium range, ‘Healthy Living’ products and a selection of own-brand ‘Italian’ foods. The Co-op’s fish range contains only fish from responsible sources (the same applies for any own-brand products that contain fish or seafood). Shoppers are also offered the largest range of Fairtrade products of any supermarket in the UK . Co-op convenience stores offer Fairtrade tea, coffee, chocolate, wine, bananas and cotton carrier bags, while larger Co-op Food outlets also include Greek Style Yogurt with Fairtrade Honey, organic ale, Fairtrade cakes and a range of fruit smoothies. Co-op Food stores also provide seasonal Fairtrade products including Valentine’s Day roses, Easter eggs and Christmas puddings. Wines, ales, spirits and soft drinks are also sold in each store, along with the Group’s ethical water bottles, which help fund clean water projects in Africa.